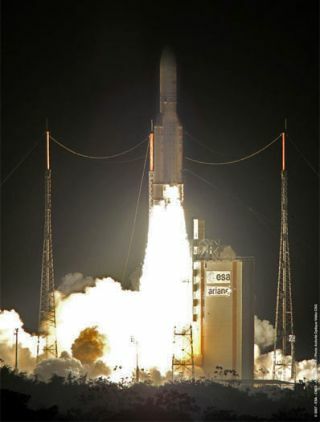 An Ariane 5 rocket launches two satellites into space from Kourou, French Guiana. An advancedspace-based Internet switchboard-in-the-sky and a Japanese direct broadcastingsatellite were successfully hauled into space Tuesday aboard an Ariane 5rocket, making its third flight of the year. The166-foot-tall Ariane 5 ECA rocket, fitted with two solid rocket boosters and acryogenic upper stage, came to life at 2344 GMT (7:44 p.m. EDT) and sped awayfrom its oceanfront launch pad. The rocket flew east away from the launch siteat Kourou, French Guiana. Theheavy-lifting European rocket disappeared into low-hanging clouds seconds afterliftoff, but tracking cameras recaptured picturesque images of the launcher asit ascended into sunlight a few minutes later. The twinsolid-fueled boosters, payload fairing and first stage were all jettisoned ontime. The cryogenic upper stage completed the task of placing the satellitepayloads into orbit. Recoveryships were stationed east of Kourou to retrieve the solid rocket boosters afterthey parachuted into the Atlantic Ocean. Arianespace officials said the vesselswill tow the spent motor casings back to Kourou for disassembly and analysis,but there are no plans to reuse the boosters. Telemetryfrom the rocket confirmed the deployment of the Spaceway 3 and BSAT-3a payloadsabout a half-hour after liftoff. The Ariane 5 reached an egg-shaped transferorbit stretching from a high point about 22,300 miles to a low point of 155miles, with an inclination of about two degrees. Arianespaceofficials declared the launch a success shortly after spacecraft separation,marking the Ariane 5 rocket's 19th consecutive successful launch. "Withthis perfect launch of Ariane 5, you have once again seen a furtherdemonstration of the excellence of European technology," said Jean-Yves LeGall, Arianespace chairman and chief executive officer. Spaceway 3was first to separate from the rocket's upper stage. The 13,400-pound satellitewill propel itself into a circular 22,300-mile-high orbit above the equator at95 degrees west longitude. The craftwill be operated by Maryland-based Hughes Network Systems for more than 12years, beaming Internet and multimedia services to businesses, government usersand private consumers across North America. The spacecraft was built by BoeingSatellite Systems and is based on the Boeing 702 design. "It'sa defining moment for our company because for the first time, we will own asatellite on our own," said Pradman Kaul, chairman and chief executiveofficer of Hughes Network Systems. "We now can offer an end-to-end servicewhere every piece of that service is provided by Hughes. I don't think there isany other company in the world today that can make that statement." Spaceway 3was originally tagged to fly into orbit aboard a Sea Launch Zenit 3SL rocket,but the ocean-based booster exploded on its floating launch platform in acatastrophic Jan. 31 failure. The accident caused Hughes to move Spaceway 3 toArianespace, which has a strategic alliance with Sea Launch for suchcircumstances. "Whenwe signed this contract last February, I committed to launch your spacecraftbefore mid-August," Le Gall said. "I think we did it with a littlemore than two hours in advance." Thehigh-tech satellite includes advanced antenna technologies that allow theKa-band communications system to shape spot beams to meet real-time demands forbroadband services. A digitalsignal processor aboard Spaceway 3 will be able to switch and route broadbandtraffic, removing the need for a ground station, according to Hughes. "Weare very, very excited that we have the opportunity to move the world ofbroadband data access to the next level," Kaul said. Boeingengineers will oversee the orbit-raising and commissioning phases of Spaceway3's mission, and control of the spacecraft will be handed over to Hughes by theend of the year. Commercial service for Spaceway 3 should begin by nextJanuary. Six-and-a-halfminutes after deploying Spaceway 3, the Ariane 5 upper stage released BSAT-3a,a 4,365-pound satellite for the Broadcasting Satellite System Corp. of Japan. "Wehope that the safe and stable mission of BSAT-3a will continue until the end of[its] life," said Kenji Nagai, president and chief executive officer ofBSAT Corp.
BSAT-3a isbeginning a 13-year mission to beam direct-to-home digital televisionprogramming to customers across Japan. Built by Lockheed Martin, the satellitecarries 12 Ku-band transponders, eight of which can operate at one time. "BSAT-3awill provide direct broadcast links for the entire Japanese archipelago fromits geostationary orbit and we are pleased that BSAT has entrusted LockheedMartin with this important mission," said Marshall Byrd, vice presidentand general manager of Lockheed Martin Commercial Space Systems. The craftjoins a fleet of four other broadcasting satellites owned by BSAT Corp. Thesatellites provide a combination of analog and digital services. BSAT-3awill be primarily used by NHK, Japan's largest broadcasting company and anearly 50 percent shareholder in BSAT Corp. The satellite will broadcastprograms to more than 20 million subscribers. Arianespace'snext launch is scheduled for late September, when an Ariane 5 GS rocket willorbit the Intelsat 11 and Optus D2 communications satellites. Three moreAriane 5 missions are slated to round out the year, including next month'slaunch. Copyright 2007 SpaceflightNow.com,all rights reserved.